I'm up early, and out on my balcony-wearing earplugs, because even on this little side street, the horns are incessant. I relax, snack on junk, and read. I wander down to Palmyra Hotel. (Weird... I'm still having trouble getting my bearings in this small town.) I'm standing outside, trying to figure out where the entrance to the hotel actually is and a man opens a door. 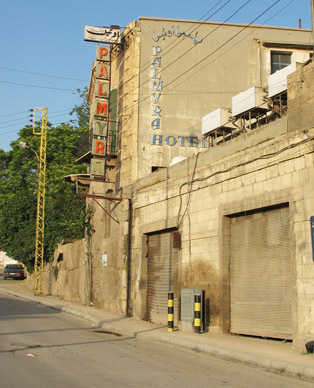 "Palmyra Hotel?" I ask and he nods. I explain that I came into town yesterday and that I already have a room, but expect to come back to Baalbek with my wife. He asks me how much I'm paying, I say "17 dollars" and he chuckles and says "Too much". I ask if the Palmyra is $38 as my British friends indicated, and he chuckles and says "yes." He invites me in. It's big and dark; old. It's loaded with atmosphere and it feels vacant. Per the guidebook's recommendations, I ask if I can see rooms 25, 27 or 28, and he says "Of course." They are fine and have decks and are shaded by trees to some degree. The road here doesn't seem too horn-heavy right now, so this could be a nice place to stay. We head back downstairs. I mention the two British gals I met in Palmyra. He thinks for a few moments and opens his registration book. Yep, there they are, and it seems that they had the hotel to themselves a week ago as well. I'm study the antiques display in the public lobby and he asks if I'm interested. I indicate that I am, and he makes a phone call. A few minutes later he takes me outside, to the right, and up a small road. On a right a metal gate is open to a driveway and I'm met at the door of this very nice house by an elderly woman, perhaps French. She invites me into the nice home, and leads me to the sitting room, where three glass cabinets are full of flawless, fist-sized antiques. 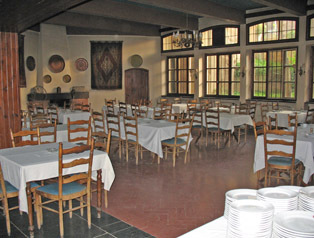 On the remaining walls are a display of knives and pistols and two rows of Russian type religious plaques. As the woman goes to get coffee, I stare. A man-her husband, I guess-comes in. I ask about a few items. The least expensive tear vials are $70. There's a very cool stone cat, maybe 4 inches tall. I think that it's $150 or $200. I see items similar to those I've seen in museums and the feel of it all is quite real. The man explains that there is no problem leaving Lebanon with small antiquities, but I'm not confident of that. What's more, I'm not simply flying home from Beirut; I've still got three more Middle Eastern borders to cross. I don't buy anything. I wander around town, eat a couple of pitas for 33 cents each, and then head back to my room's deck where I continue writing, cutting-down maps to their essentials and relaxing. Staring at my newest map of Syria, I formulate a plan for the ride back. My plan is to bike down to the main Damascus-Beirut highway, head west toward Damascus, but then cut south to Qatana. If it turns out that there isn't a hotel in Qatana, then I'll ride 15 k east to Al Kisweh, where my new Syrian map shows a little 'C' (indicating a camp ground). So tomorrow will be either a 68 k ride or an 83 k ride. I plan out the next few days and decide that I'm going to skip Amman. Cities are work on a bike. Noise… It's 5:30 pm. I've had earplugs continuously since last night, except for the hour or so walk around this morning. Don't leave home without them! The Palmyra Hotel does not look like much from the street.. It's insides have probably not changed in 50 years. 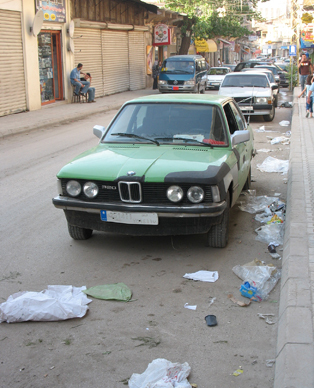 Baalbek, like many of the other cities I've been in, needs to address its litter problem.